Decorating the house for holidays is so much fun. Bring a little bit of the holiday spirit to the rooms…or even the outside…of the house puts us all in the mood to celebrate. 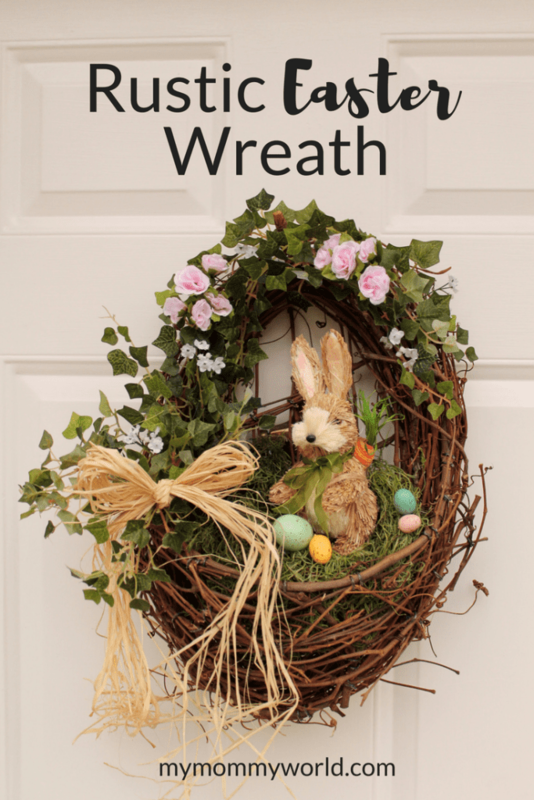 This year, I created this Rustic Easter Wreath to hang on our front door. 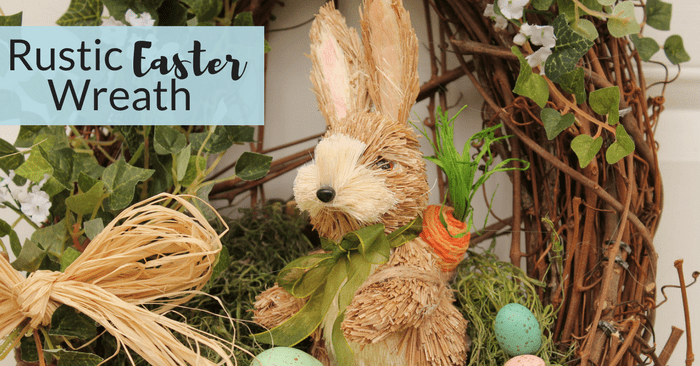 The cute little bunny and pretty spring flowers and eggs welcome us into our home with such cheer that it feels like Springtime…even when the weather feels more like winter. 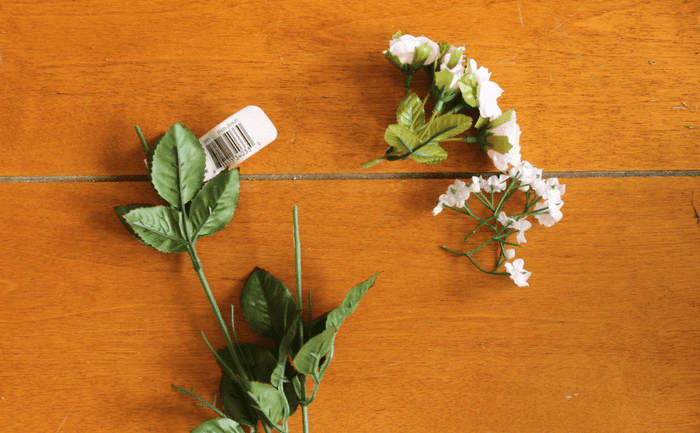 To begin, you’ll want to gather your supplies: a wreath, various greenery/silk flowers/moss, and some Easter-themed decorations, as well as a hot glue gun or craft glue. This little Easter bunny that I found at Michael’s is so adorable! I just love the little carrot he carries on his back! 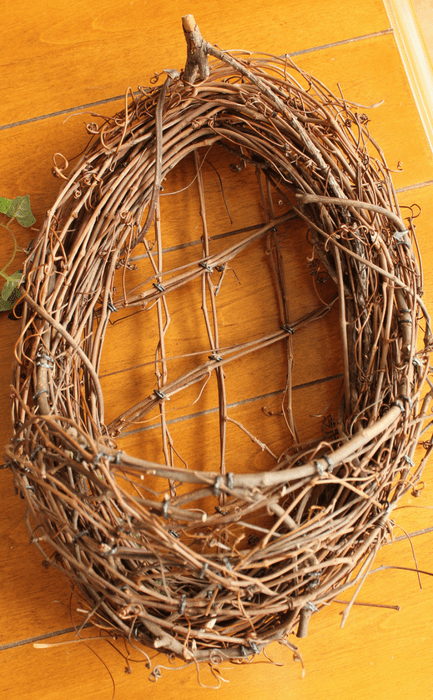 When I saw this egg-shaped grapevine wreath in the store, I knew it would be perfect for making an Easter wreath. It has almost a pocket on the front, into which I tucked some Spanish moss for my bunny to rest on. I chose some pretty pink flowers in the floral section that had a couple of blooms per stem. Because they were so long, I just cut the flowers off the stem so that I could glue them onto the wreath. After putting all the greenery into place, I glued the bunny into his spot with plenty of hot glue. I thought there could be a chance that he wouldn’t stay upright, but luckily, he stayed right in place. 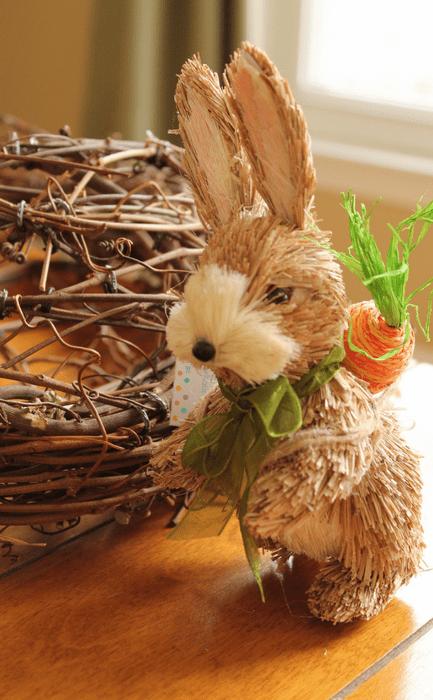 Lastly, I tucked a few small Easter eggs that I removed from a larger egg “branch”, and glued them into place around the bunny, and finished the look with a bow made from raffia. A burlap bow would also look pretty there too! After all was said and done, this pretty wreath only cost just over $20 and about 20 minutes of my day! 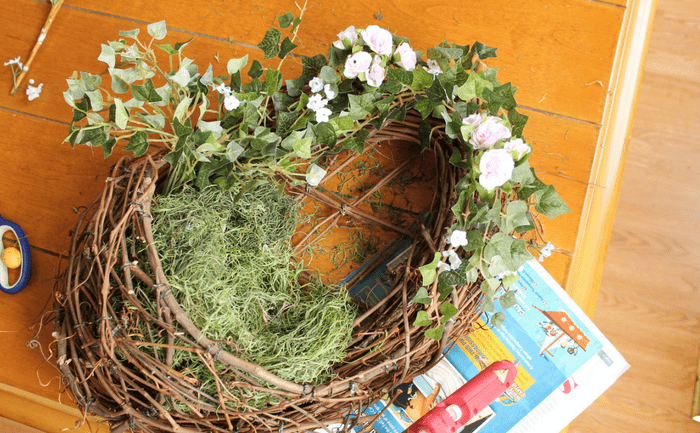 I hope you’ll try making a rustic Easter wreath of your own to brighten up your home this Easter season! What a cute wreath. I know our weather has been more winter like here too. But it is finally starting to warm up a little. Hi Erin! I saw your post at CreativeKKids link party. This is such a cute and simple idea. It’s nice when there are projects that even non-crafters can make and be proud of. As a crafter, I think I tend to get a little complicated. I will have to remember to look for some simple ideas to incorporate into my blog. 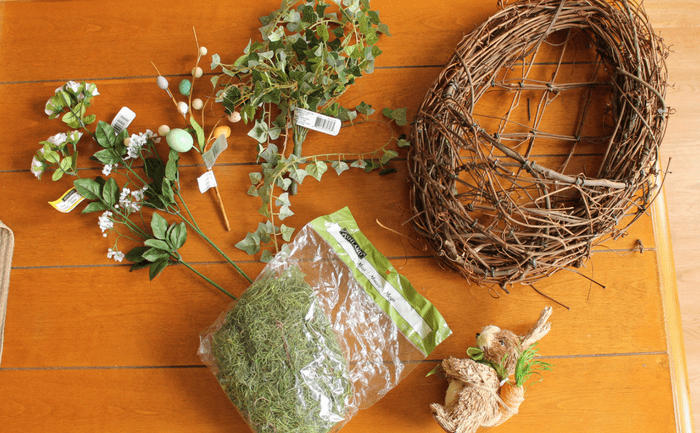 Thank you for this adorable wreath tutorial! Hi Laurie! Thanks so much for stopping by today! Thank you so much 🙂 I appreciate you sharing it on Pinterest…hope your Pinterest friends enjoy it! That is so very cute! I will be looking for a wreath like that! 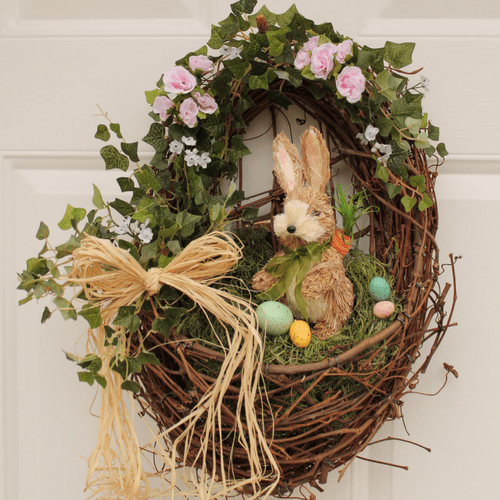 Your Easter wreathe is lovely; I would leave it up all Spring at my house! Nice simple tutorial for people who aren’t particularly crafty, too! I appreciate you stopping by Kathy! The shape of your wreath form is perfect. It makes your little rabbit look secluded and cozy. Very very pretty wreath. Aww, thank you so much for saying that Leanna! Adorable, Erin! Love your Wreath!! Thanks for sharing with us at the TFT party! I’ve Pinned to the party board and will be featuring you tomorrow! Cheers! Such an adorable Easter wreath Erin. Thank you for sharing it at Create, Bake, Grow & Gather this week. I’m delighted to be featuring this DIY at tomorrow’s party and pinning it too. Thank you so much Kerryanne! It’s such an honor to be featured 🙂 Hope your readers enjoy it! This is just adorable! Cute without being overly cutesy, if you know what I mean. Just right! Thank you so much for joining the Grace at Home party at Imparting Grace. I’m featuring you this week! This wreath is just so adorable! I was happy to feature you at TFT this week. Thanks for sharing and please do join us again! Think this is my first time to visit you. I love your wreath….it is just darling! !